CAMP GEN.SIMEON OLA (July 11) – Police Chief Supt. 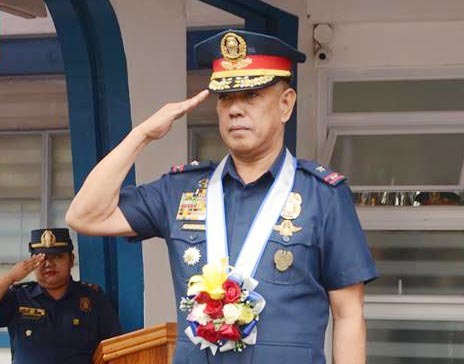 Antonio N. Gardiola, Jr. took the helm of the Philippine National Police Regional Office 5 (PRO5) Monday (July 11), after a turn-over of command from P/Chief Supt. Melvin Ramon Buenafe who has reach the mandatory retirement age in the presence of PNP Chief Dir. Gen. Ronald de la Rosa and his directorial staff. In his message, RD Gardiola extends gratitude to the PNP hierarchy for the opportunity to serve his fellow Bicolanos. “The biggest challenge in my career is now here.. to keep my fellow Bicolanos, my Kababayan, safe and secured”, he said. The official pointed out that he cannot face the challenge without the support of the officers and men of the PNP and the public by his side. He further said in local dialect, “ Sa sakong mga kababayan na maoragon, tabangan nindo ako, tabangan nindo kaming kapulisan asin militar, magkaburogkos kita . Labanan ta an paglaganap kan illegal na druga, rumpagon ta an manlaen-laen na krimen sa satuyang sosyodad. Bantayan ta an satuyang mga natad na dai nanggad matungtongan kan terorismo, dai kita magtogot na maghadi an karaotan sa karahayan, dahil kita po, kita gabos gustong mabuhay nin matiwasay asin matoninong”. He appealed to the public to join him and the entire leadership of the PNP to make Bicol region as the most peaceful and safe community, united in Pres. Rodrigo Duterte’s vision of our country that is free from drugs and corruption. In his statement, PNP Chief Dir. Gen. Ronald de la Rosa said that PRO5 has been exclusive for Bicolano top ranking officials via succession. And these are from P/Chief Supt. Cecilio B. Calleja,Jr., P/Chief Supt. Jose Arne de los Santos, P/Chief Supt. Clarence V. Guinto, P/Chief Supt. Victor P. Deona, P/Chief Supt. Augusto M. Marquez, P/Chief Supt. Melvin Ramon Buenafe and now to P/Chief Supt. Antonio Gardiola, Jr.